The LSU Tigers are ranked No. 23 in Sports Ilustrated's college football preseason Top 25. After an impressive if inconsistent freshman season—six games with 52 yards or less rushing and five games of more than 100—Leonard Fournette will be one of the nation’s most exciting players. The 6' 1" 230-pounder will be the focal point of coach Les Miles’s offense, especially because LSU has yet to determine who will be under center. Last year’s starting QB, junior Anthony Jennings, was suspended after his arrest in June for unlawful entry of a dwelling. Miles reinstated the 6' 2", 216-pound Jennings (11 TDs, seven INTs in 2014) on July 31 after the charges against him were dropped. The Tigers’ other option, sophomore Brandon Harris, has made just one career start but has impressed the staff with his confidence and command of the playbook. It helps that LSU has a veteran offensive line and one of the nation’s best young receiving units in 6' 3" sophomore Malachi Dupre, 6' 2" junior Travin Dural and speedy 6-foot sophomore slot receiver John Diarse. After two seasons as an assistant at Alabama, Kevin Steele takes over as defensive coordinator. Expect him to lean on the secondary, where senior safety Jalen Mills, a potential first-round pick, is paired with promising junior cornerback Tre’Davious White. 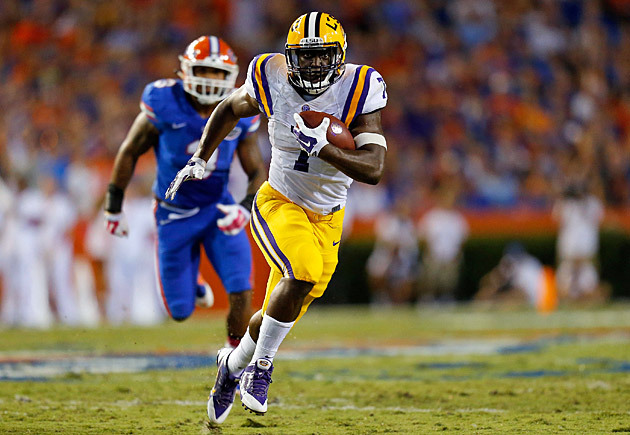 The challenge Leonard Fournette presents is that he’s so fast and so physical, he can run inside and out ... LSU’s uncertainty at quarterback was really key last season. Both Anthony Jennings and Brandon Harris are very talented, so I think they’ll get it figured out. They have a ton of skill on the outside and a formidable running game. The QBs will get some play-action going and not hurt the team by trying to do too much ... They lost some guys in their front seven, but everybody in their back end returns, and they already had an extremely talented secondary. That back four is going to be something to reckon with ... I think you’ll see some stuff that’s similar to what Alabama runs with [defensive coordinator Kevin] Steele arriving. He’s a great defensive mind. A candidate for the Outland and Lombardi awards, 6' 6", 320‑pound senior Vadal Alexander is switching to right tackle after starting 25 games at left guard over the past two seasons. Alexander has lost 30 pounds since his freshman year, but he still has good size, and coaches like his ability to eliminate linebackers in the run game. After the home opener against McNeese State, there will be no easy prey for the Tigers. September includes back-to-back dates with teams that beat LSU last season, Mississippi State (away) and Auburn (home). The season ends with a savage November: at Alabama, Arkansas, at Ole Miss, Texas A&M. Getting into the playoff picture will be a daunting task.